Now I'm grown up. 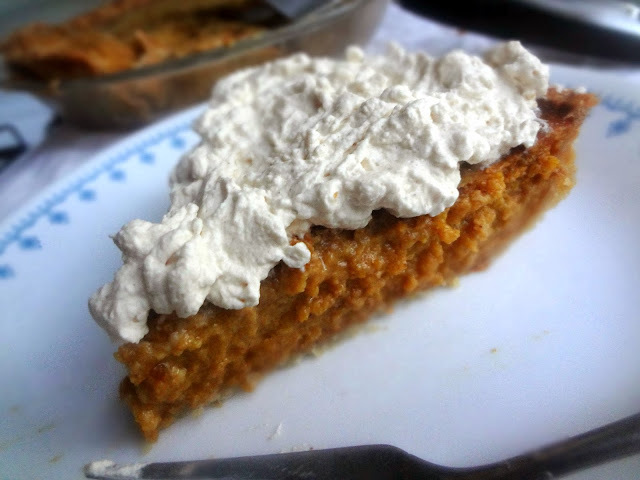 And I made a grown up version of my beloved pumpkin pie. As a "grown up" I've really gotten into eating food from scratch: real, natural, and oft-times organic food. So when I was approached by Stahlbush Farms, I jumped at the chance to review some of their product. "Stahlbush Island Farms is an environmentally friendly farm and food processor committed to sustainable agriculture and exceptional quality. Stahlbush has been family-owned since 1985." Stahlbush Farms sent me some super tasty frozen grapes to try AND-dun dun dun duuuun!- their Farmer's market brand Organic Pumpkin! And obviously I knew what I had to do: make a healthier pumpkin pie (after all, when dealing with an organic pumpkin puree with no additives, I couldn't ruin it with a bunch of other gunk). 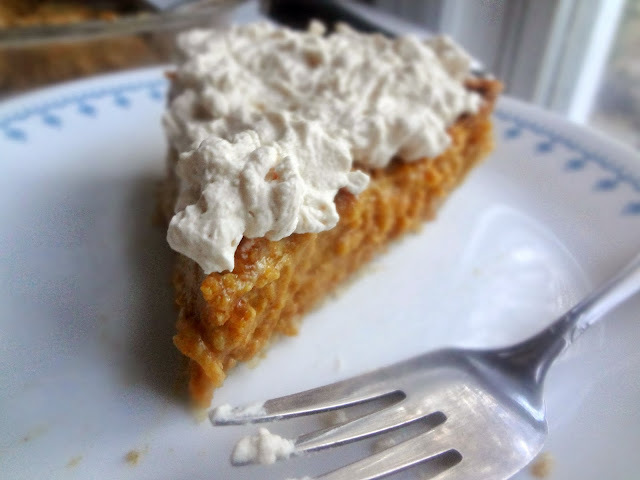 So I made a whole wheat pie crust, and topped it off with a just slightly sinful cinnamon caramel whipped cream. Mmmm yes. I'm gonna be straight with you right now: when I was making this pie I felt like everything was going wrong. 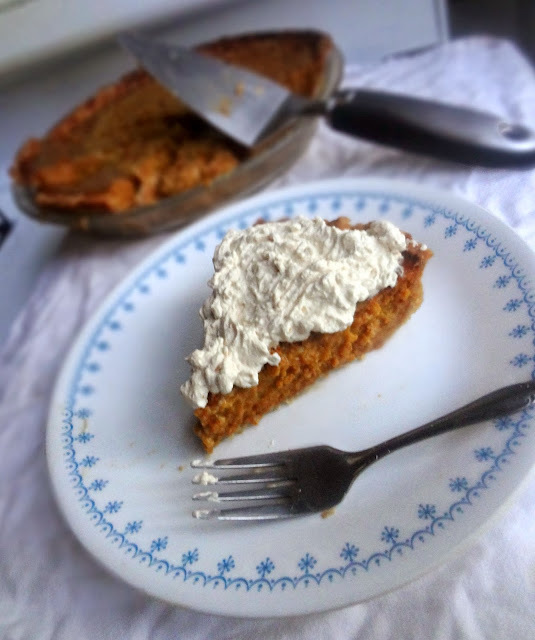 I had some issues with the pie crust being too sticky (I had to throw half of it out! Ugh, don't worry though-just follow the instructions below and you should be good. I've updated them so you hopefully won't have my problems) and THEN I was a big old idiot and poured the pie filling into the crust....before I'd mixed the evaporated milk in. *sigh* I only had a minor conniption, eased by the Michael playing "Iris" by the Goo Goo Dolls (he thought it might help calm me down, he was right). End of the day, everything turned out fine. I fixed all the problemos. And still ended up with a tasty tasty pie. Crisp, flaky, hearty pie crust. 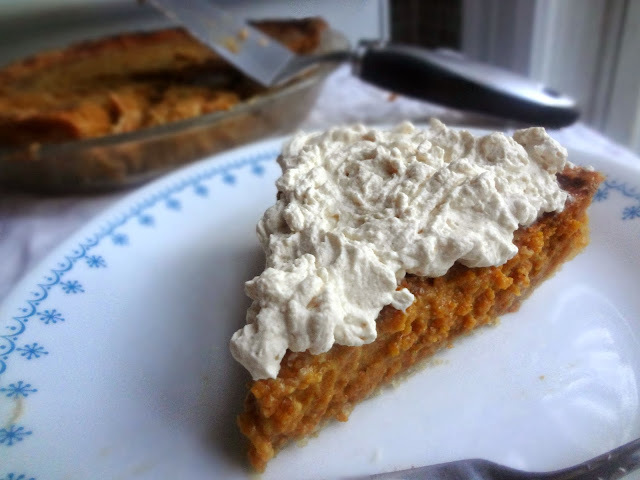 Creamy, dreamy, spiced to perfection pumpkin filling. And a sweet whipped cream with just a hint of spice on top. Oh little Kayle, you had no idea what heights pumpkin pie could reach. Make this for Thanksgiving. Impress everyone. You're welcome. Grate frozen butter and place in a freezer until ready to use. In a medium bowl, whisk together flour and salt. Add in frozen, grated, butter. Use fingers to break up clumps and toss until evenly combined. Stir in cold water with a large spoon. Add a bit more water if it's too dry, but be careful-you don't want a wet dough. Divide dough in 2-if not using right away, wrap each half in plastic wrap and refrigerate or freeze (depending on when you'll be needing the dough)-this recipe makes 2 crusts so either double the filling recipe and make 2 pies or put 1 crust in the refrigerator or freezer. Thoroughly flour a work surface and place crust dough on it. Flour the top of the dough and a rolling pin, and (starting in the middle) roll out so the dough is at least 1 in. large all around than the pie plate (if bigger, trim it so it's only 1 in. of extra around). Frequently check and re-flour to prevent sticking. Gently transfer dough to a buttered and floured pie plate (don't stretch the dough). Flute edges if desired. 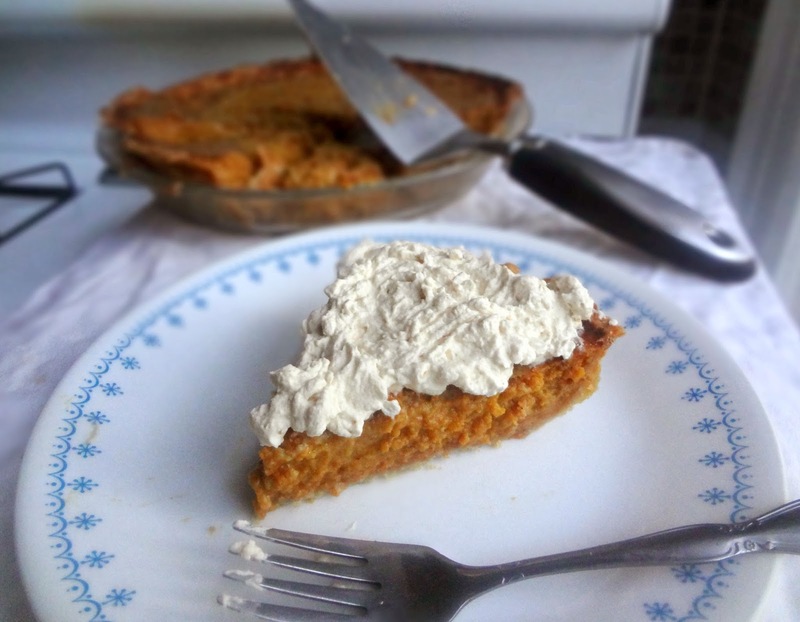 Use a fork to poke a few holes in the bottom of the pie. Preheat oven to 425 degrees. Place pie plate (with crust) on a baking sheet, to prevent any spillage or overflow. In a small bowl combine the sugar and spices. In a large bowl beat the eggs. Stir in the pumpkin and the sugar-spice mix. Gradually stir in evaporated milk. Pour filling into the unbaked crust. Bake 15 minutes at 425 degrees. Reduce temperature to 350 degrees for 40-50 minutes (or until a knife inserted in the center comes out clean). In a chilled bowl, beat heavy cream until soft peaks form. Add in caramel, sugar, cinnamon, and cornstarch (taste and adjust amounts if desired). Beat until stiff peaks form. Place on top of the prepared and cooled pie before serving. Disclaimer: I was provided with product from Stahlbush Farms to try, but I was under no obligation to review if I so chose. Nor was I under any obligation to write a positive review in return for the free product. My opinions, as always, are all my own.